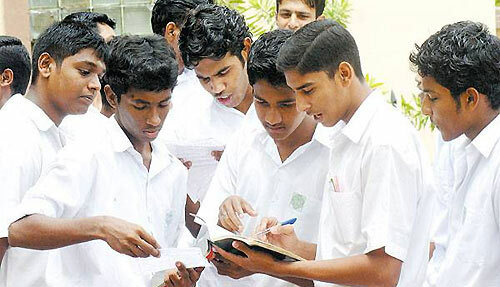 The results of the GCE A/L examination held last year had been released today and results can be obtained from www.doenets.lk and www.results.exams.gov.lk, the Examination Department said. Dasun Jayasinghe from Royal College Colombo 7 has obtained the island best results from Maths stream. So what? Nothing to be proud of. Ranjith, what is the problem? Hurt? Congratulations Dushantha putha and Royal (for producing an outstanding student). I am not hurt at all. The problem is any fool can pass a exam . The way Sri Lankens pass exams we should on our way to Mars and Jupiter. But we are not getting anywhere by passing these exams. If this Dushantha or any other person study and pass in Chemistry or Physics it does not mean anything. But if they produce or make something ofcource I say they are clever. This this Dashanrha stay in Sri lanka he will be a stupid maths teacher producing stupid pupils like him self. If he go to a developed country he will be a toilet cleaner like manny Sri Lankans. I do not want to insult any body. This is the truth. Please tell me what primary education these people had. Honda, Ford, Roll Royce, Man who build Tugh Mahal. Right Brothers, Singer, Tata, Our kings who build tanks etc, Stouger. The only clever person I know who went to a school is Ian Stain. Do you know what the teacher said his parents . “This boy is retarded please take him out of school. I also like to point out some clever business people who has only had primary education and became successful business people. Maliban, Easy jet man, Liver brothers, Alan Sugar, Boots, Tesco, Richard Branson. Ranjith, Thanks you bring many irrelevant issues and I do not want to comment. How ever, you said any fool can pass an exam. Then why other fools can’t pass this exanm which we are talking about? Again you say, ‘This this Dashanrha stay in Sri lanka he will be a stupid maths teacher producing stupid pupils like him self.’ So, you are saying all maths teachers in Sri Lanka are stupid. God bless SL’s education system! Concern, You say Royal has everything. Then what about Ananda, Nalanda, D.S. Senanayake, Mahanama, St. Thomas, St. Josephs, Viskaha, Bishop, etc do not have that facilities? The reason others cannot pass these mats exams or other exams because they are not interested in memorizing books and getting these meaning less qualifications. Every day some one in hire authority is arrested for fraud. The only export it does is exporting servants to middle east, and idiots like Danuska to work in develop countries as taxi drivers, porters and cleaners. Tell me where in the world passengers try to getting to a bus or train before others get off. Just stand on by a busy road and observe the way these people drive and behave. So where is this education you are talking of. Mr Amarkoon. Our mechanics, bricklayers , electricians and plumbers are the best in the world, look at the Wesak day. The pendols etc. If that is not electric and I don’t know what is engineering. These are very clever people we phrased and support. The cream of the country is gone and only the drops are still here. Please sir, this education system is not working. No good inventing the wheel. It is already done. So just studying what already done is meaning less. Let’s see our so called engineers done so far. If you pass Moratuwa university our budding engineers have made a replica of a space shuttle. Wlth what? WITH CARD BORD HA HA HA. First we must teach our children manners like to say sorry, and thank you. Ours is a agricultural country. Every day sun is shining on us. We should learn to enhance this energy. We should give all the support to our farmers etc. No point trying to make cars . any electronic things. World is full off those. Sri lanka is a very beautiful country. I don’t want to insult anybody. This is the only way to raise my point. I strong apologize if I hurt some one’s feeling or insult some one. By the way when I took gcse failed on all subjects twice. Now I put mind and end up with a degree in Maths and Engineering in very famous university. So as I said any fool can pass or do any thing if you put your mind to it. We all have the capacity to do anything, Only person who can stop is yourself. Sir that is my opinion. Once again I apologize if I upset any body. Dear Ranjth, Thank you so much for much elaborated response. You are spraying bullets all over the place and I would like to be focused. The student in question excelled in Maths. I do not know in maths you have to memorized. May be knowing the theorems understanding it and apply it correctly to arrive at a solution. This will be not the case if the same some appear in the exam. Thank you again. I admire the contents of your blog. Many with Maths Hons, Science, Law, Engineering and even Medicine and others with PhD’s from Sri Lankan Universities are capable of nothing more than administrative jobs in Sri Lanka and other jobs such as admin, school and office cleaning, toilet cleaning in the western countries. Every year, Sri Lanka conducts GCE (AL) and GCE (OL) and in these exams someone has to become first. Not a big deal. With private tuition and strict discipline at home with a deprived existence (no friends, no fun, books only), it is quite easy to become No. 1. What matters in this world is (1) ABILITY TO FOCUS and (2) ABILITY TO THINK INDEPENDENTLY. Our education system and political and entrepreneurial leadership fails to prmote these qualities. SL is primarily an agriculture based economy but there is no dignity in being an amude-wearing agriculturalist. Our dumb politicians are under pressure to deliver means of existence to the population. What they did was to offer tax free facilities to a few mudalalis to manufacture underwear to western population. Our current stupid politicians want us to tighten nuts and bolts and assemble Volkswagen vehicles. Our politicians and entrepreneurs are so dumb that they failed to provide incentives for innovation that will lead to maximising agricultural production. They have failed to recognise and provide incentives for innovation. They are spending millions of tax-payer money into a stupid, non-productive system of education. We all know what success means in Sri Lankan eyes. A successful family in SL is where the father is a corrupt, kommis-karaya living in a shiny storied house on 7 perches of land in Colombo 3, 4, 5 or 7, the kids going to Col 7 schools/private schools, car and driver for family use and birthday celebrations in inhygenic but luxury restaurants, the kids frequenting night clubs and occasionally trying out a bit of kudu. Ranjith, your comments in the blog are fantastic. Why can’t Sri Lanka create it’s own brand of computers with its own operating system, similar to Apple? Ranjith, could you please suggest a name ? i dont agree with ranjith for to be on top is something to be proud of rewards of dedication and commitment apart from being clever. The next thing he will be faced with is finding a good university to further his higher education. Sri Lankan university standards are relatively poor, poor because higher learning is limited to getting a PhD from some place and become an academic does not go beyond teaching what they have learnt. What is the scope of research in Lankan universities. How many papers have these researchers have produced over the last decade and where have they been published. Papers that are not spun off from their doctoral thesis! The only tradition that Dashun could follow his mentor …..probably his professor and like him end up being a loser. There isno working environment in Sri Lanka so the least they could do is making cardboard replicas of whatever ….the professors ought to have put a stop to it ….but most likely they must have inspired them.